At first glance, it’s easy to dismiss Keynote 3 as a minor upgrade—even the icon hasn’t changed. But lurking beneath the surface are many new features Keynote users have been clamoring for. 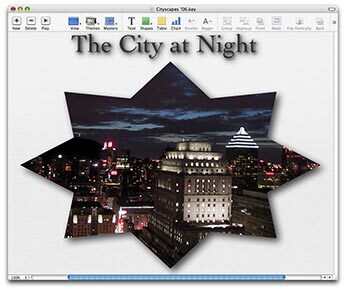 Although the program still isn’t perfect, those enhancements make Keynote an even more compelling alternative to Microsoft PowerPoint 2004 ( ; August 2004 ). One of the features most requested by Keynote fans was a better set of built-in graphics tools. While you’ll still need a dedicated program such as Adobe Illustrator for complex illustrations, iWork’s beefed-up graphics tools should be adequate for most users. The new free-form Shape tool with Bézier-curve support is especially welcome. Keynote also now supports resizing of grouped objects, a feature that has been near the top of my wish list since the initial release. Like Pages 2, Keynote now lets you do basic image editing via a translucent, iPhoto-like palette with controls for changing brightness, contrast, and other parameters. Since your adjustments affect the way Keynote displays the image, not the underlying image itself, you can undo your changes at any time with a single click. Keynote’s theme library includes a few more choices than before, and several themes are now available in higher resolutions, up to 1,920 by 1,080 pixels. The Slide Inspector has several clever 3-D-transition options, including one that simulates a revolving door. Make Your Own Mask In Keynote 3, you can use any geometric shape as an image mask. Another feature high on many wish lists was support for more than one bulleted text box per slide. That wish has been granted. Keynote 3 lets you add bullets to any text box. And because Keynote 3 lets you individually style each paragraph in a bulleted text box, you can now do things like display two text bullets, insert a picture, and then proceed with the remaining bullet points. Doing the same thing in Keynote 2 required splitting the builds across several slides. Keynote 3 also supports builds in masters, so you no longer have to edit builds slide by slide. In addition to 2-D charts and graphs, iWork ’06 sports 3-D charts with interactive controls that let you tweak the lighting and alter the viewer’s perspective; the expanded chart repertoire includes scatter plots. Keynote’s tables now function like rudimentary spreadsheets: in addition to simply displaying static text and numbers, you can perform simple calculations such as addition and multiplication on a range of table cells, and you can tell Keynote to sort table rows based on the contents of any column. Keynote 3 finally includes a functional slide sorter that lets you select any subset of slides and drag them anywhere in the current presentation or into another open presentation. The individual slides are larger than the Navigator’s tiny thumbnails, but they’re still too small for many eyes—Apple ought to add a sliding magnification control like the one in iPhoto. Presenter Display, which shows the current and upcoming slides on the presenter’s screen, now has a menu-bar indicator that shows when Keynote is ready to display the next slide. Another new option lets you use Exposé and Dashboard during a slide show, so you can easily switch from your presentation to an application or a widget. Keynote 3 also gives you greater control over QuickTime movies while they’re playing in slides. Keynote’s new comment feature lets you add text notes to slides—handy if you collaborate on presentations. (Comments stay hidden when you run the slide show.) If you have to share your presentation with people who don’t have Keynote, you can now export your presentation to iDVD or as HTML, and new PDF-export controls include the option to save every stage of a build on a separate page. Despite its many improvements, Keynote 3 suffers from a few omissions. For example, it doesn’t let you interact with QuickTime VR movies during a presentation, and you can’t embed hyperlinks to applications or documents. Unlike PowerPoint 2004, Keynote doesn’t let you record narration for slide shows unless you use another application, and its support for audio files that span multiple slides is limited. Keynote’s uncluttered interface is more accessible than PowerPoint’s, but controls for setting attributes for text and graphics are spread across several Inspector tabs. Although you can cut and paste styles between objects, Keynote would benefit from a palette with named styles. Keynote 3 can read older presentations, and an option in its Save dialog box lets you save in iWork ’05 format. But there’s a bug that alters the formatting of text in older imported presentations, which you must then manually clean up—Apple is aware of the problem and promises a fix. The latest version of Keynote builds on its predecessor’s considerable strengths while making a sizable dent in a shrinking list of missing features. If you’re new to Keynote, or if you’re still using Keynote 1.1, iWork ’06 is well worth its price. Keynote 2 users may grumble about Apple’s lack of upgrade pricing, but Keynote 3 lets you do things that would have been difficult or impossible to do before, or that would have required another application. For many presenters, that’s enough to justify the price.